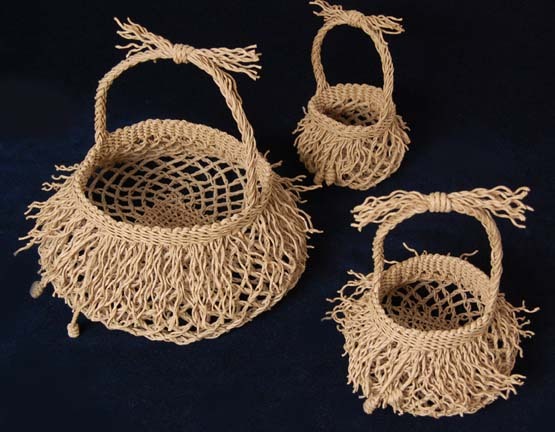 These baskets are made with 3-ply Danish cord, a commercially-made paper cord used for weaving chair seats. The photo on the left shows the three sizes, and the one below is a close-up of the bottom the Large Garlic Basket. The Small base has a total of 16 cords. Two additional cords are added on each side of the Medium (total of 24 cords), and two more on each side for the Large (total of 32 cords). 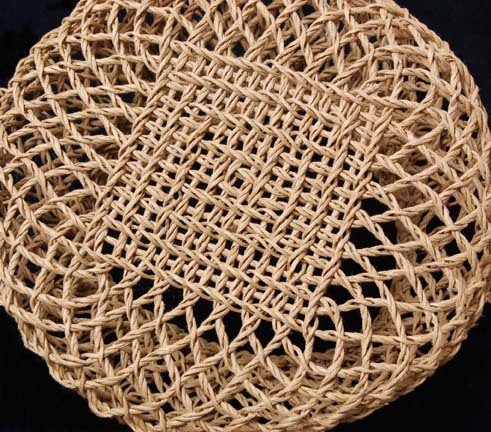 The Small Garlic Basket can be completed in a one-day workshop. John and I made a 47-minute video on how to make the Ply-Split Garlic Basket. You can purchase this as streaming video from Taproot Video. You can also view scenes from the video speeded up so you can see the process of making the ply-split garlic basket in 5 minutes! You can order a kit with pre-cut lengths of Danish cord from my Kits page, and a size 8 gripfid from my Tools page. This page created October 3, 2006, and updated on April 11, 2017.